The casino industry has always been one of the first to respond to technological advances, trying to keep at the forefront and offer users newer and better products. With the competition in the field, it’s easy to understand why, and the consumer gets the benefit. First there was the early days of online casinos, when the novelty was to play beloved games from the comfort of the home. Then, to satisfy people who yearn for the best of both worlds, real and virtual live game streaming was also introduced. Now, with the proliferation of smartphones and tablets, it has become necessary for casino games to be playable on these devices too. Right now is the age of the app – developers have come up with apps for every single thing that a person needs to do via mobile. Since gaming has become an important function for smartphones, casino apps were a natural progression. Almost all leading casinos have launched their casino apps, though some of them are favored over others. What most players look for in these apps is that they should be well-designed and have an easy-to-use interface. The app should incorporate security features and should not freeze or crash while a game is in progress. Here is a look at some of the leaders in the field. Everyone knows that Leo means lion. While the lion is the king of the jungle, LeoVegas have created the undisputed king of the casino apps. Over 500 casino games can be played through the app using your smartphone. The app is available in a web-based HTML5 version, or a completely downloadable one for both the iOS platform and Android, and it downloads very quickly. The apps for both the iOS and Android are available in the main menu after signing up at LeoVegas.com. The interface is bright and appeals to the senses of the user. It is clear from the design and the features of the app that LeoVegas have worked hard to create a product to satisfy their clientele. There is no scarcity of games, with 9 or more developers represented in the games library. The app looks stunning on the mobile and overall, we can say that the app is a safe bet. There is no compromise on the quality of the games offered, and a wide range of game choices are also on show. The casino app also offers a really generous welcome bonus and a loyalty scheme. If you are looking for non-stop fun, this is the place to go. A live casino option with uninterrupted video streaming, excellent customer support and fast withdrawals are some more points which work in the app’s favour. A separate sports app, which can be used to bet on live games and international sports, is also on offer. The quality of the app has been confirmed by the leaders of the industry – in 2017 it won Best Mobile Casino Product at the EGR Operator Awards, and the year before that, it received the award for Best App Design at the International Gaming Awards. Betsson has an illustrious past as far as the casino industry is concerned. The largest Scandinavian casino has evolved over the years, and they have not forgotten their loyal mobile gamers. The casino has launched an app which is available via web or exclusively for iOS and Android platforms. The web app can be accessed through any HTML-5 compatible browser, while the dedicated iOS app can be downloaded from the App store. Google Play currently have restrictions on real-money gambling apps, but Android customers can still download from the Betsson site, after following the instructions found there. 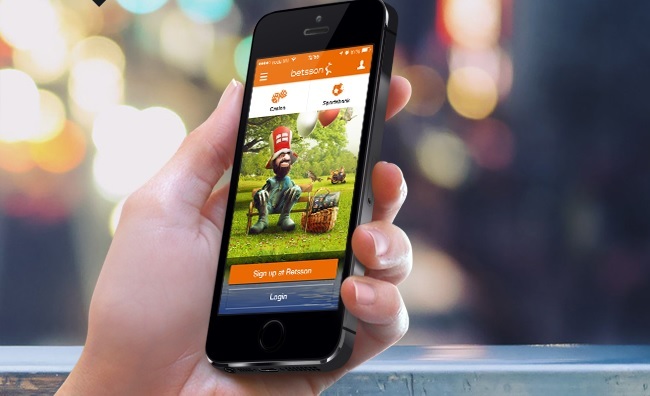 The app will give access to Betsson casino, live casino and the sportsbook. The app is designed in such a way that finding your way to the game that you want to play is easy. At the top, the games and promotions are displayed, while the side-bar to the right displays the progressive jackpots on offer. A huge selection of games is available to play, with excellent bonus offers. The games can be played seamlessly on the app, and in numerous instances are better than in the desktop version. Sports betting is comprehensive as far as the app is concerned, and punters can bet on a wide variety of sports such as football, tennis and ice hockey. The app is great for sportsbook users who want to make sure they don’t miss any opportunities. Betsson also have a dedicated Jackpot app, so jackpot hunters can keep their ear to the ground and never miss out; in 2016, this innovation won two Gaming App Awards, including App of the Year. The customer service is excellent, with 24/7 support and a live chat function. The deposits and withdrawals can be made via numerous options. The Betsson app is secure and trustworthy, and provides a wide selection of casino games and sports betting, plus excellent bonuses and promotions. A good all-rounder. Mr. Green Casino’s app is one which most gamers would love to download. With over 200 games that have been specially optimised for an enhanced gaming experience, the user is never short of choices. Most of the games can either be played for fun or with real money. This is a great advantage for beginners, who can try out the games for free before taking the plunge. Some of the games available are slots such as Starburst and Game of Thrones, progressive jackpots, different types of roulette, blackjack games, and a selection of video poker games. Some of the more popular games that can be played on the app are South Park, Blackjack Touch, Roulette Touch and Mega Fortune, to name a few. Not to be left out of the live gaming scene, live casino also makes its presence felt in the app. These feature live dealers, with an impressive 10 roulette tables, 20 blackjack tables, some baccarat tables and poker too. The live games are compatible in both the iOS and Android versions of the app, though the layout varies slightly. The app is fast and stylish with unique design and lots of games on offer. The layout and interface is similar to the desktop version, which makes it easier for the players who are familiar with Mr. Green’s online casino. The left side of the interface has options for searching for a game, with the current promotions also listed. Green Gaming, Mr Green’s responsible gaming feature which prevents a user from betting more than the self-prescribed limit, is incorporated in the app too. The games are grouped into different genres such as new games, top games and so on. The games can be launched easily with the touch of a button and there is no time lost in loading them up either. One of the features worth mentioning in the games that load on the app is that the game menus have been made smaller but easy to access. This makes the menus easy to use but it occupies very little space on the screen, thus giving the user a hassle-free experience. The welcome bonus of the online casino can be used for the app too. The casino offers a good deposit bonus. The sign-up bonuses are awarded as free spins which can be used on the NetEnt slot Fruit Spin. The app features an integrated cashier which guarantees safe and secure payments directly through the player’s device. Various deposit and withdrawal options are provided, and the limits for both are no different from the PC casino. Customer support is available 24/7 though a live chat option which can be accessed directly through the mobile device to which the app has been downloaded. There is also the option of utilizing the VIP scheme. Loyal customers of the app who bet high regularly will be treated to certain perks, such as exclusive dinners and invitations to global events such as Champions League matches and the Spanish Grand Prix. Overall the app is attractive, user friendly and offers good security with a large selection of games on offer. The casino has won awards, including Best Casino App at the 2016 Gaming App Awards. Gamers have now multiple ways to satisfy their gaming urges, be it in a land-based casino, online casino or through exclusive apps which let them play their favourite games with devices that are easy to carry and from anywhere they feel like. Well-established and trustworthy casinos such as LeoVegas, Betsson and Mr. Green offer the same security and wide variety of games in their apps as well. Casino gaming apps are fast catching up with the increase in smartphone usage and the convenience it offers. The best gaming apps are flawless, packaged attractively and offer generous bonuses. Turn your smartphone into your personal casino and play away to your heart’s content with these apps.